A hard-to-turn faucet is a plumbing issue that homeowners often face. 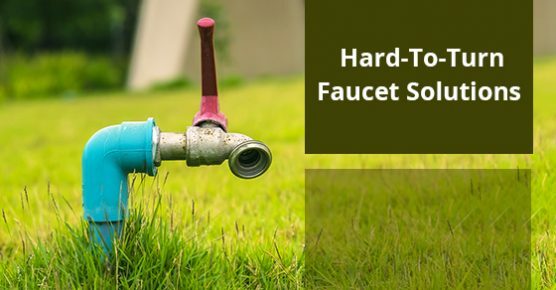 Faucets can become hard to turn over time due to many factors. Knowing how to correct this problem will save you time and money. The following are a few tips to help you loosen a hard-to-turn faucet and keep it from becoming stuck in the future. Loosening a faucet is of the many plumbing solutions you’ll need to maximize the lifespan and performance of your home’s plumbing system. Faucets become hard to turn due to the buildup of mineral deposits or problems related to the faucet’s cartridge. Regardless of the cause, you’ll need a few items to make sure you can fix the problem and have your faucet functioning properly. Some common items that are used to loosen hard-to-turn faucets include plumber’s grease, an adjustable wrench, Allen wrenches, tongue and groove pliers, and Phillips and slotted head screwdrivers. The pliers accommodate a variety of nut sizes, and having multiple screwdrivers prevents issues related to damaging the screw head while you repair your faucet. The right parts make it easy to loosen a hard-to-turn faucet. You’ll need to find the brand name on your existing faucet so that you can find the parts to match it. There are a large number of faucet manufacturers, making it even more important to have the right parts before beginning to repair your faucet. If you’re unable to locate the brand of your faucet, take a picture of it and show it to an employee at your local hardware store. This will make it easy to find the parts you’ll need. Some faucet brands may also require the use of a puller in order to remove the existing cartridge. You might still be able to fix your hard-to-turn faucet without this tool, but it can make the process much easier if you have one at hand. Faucet handles have screws that can be loosened in order to remove them. Your faucet’s design may vary, which is why it’s recommended to have Phillips and flat screwdrivers as well as an Allen wrench so that you can work with any type of screw. The faucet’s valve stem will be visible once the handle has been removed. Most are held in place by a nut or retaining clip. The puller tool can be used to remove the valve stem, as it may require a high level of force. Common forms of debris that build up in faucets include minerals, metal shavings, and grit. These should be cleaned out using a scrub brush and vinegar. Threads should be lubricated with grease, and the faucet should be reassembled once the parts have been cleaned and replaced. Faucets that don’t use a cartridge will have a brass or plastic ball in its place. These can be pulled out as well, which will expose the underlying seating and springs. Be sure that your new parts match the existing ones before you remove and replace them. These 4 simple tips will help you loosen a hard-to-turn faucet. The right plumbing solutions prevent costly repairs down the line. Knowing the common causes, having the right tools, and replacing and cleaning the faucet’s parts will help you restore the function of your home’s plumbing. If you have questions about how to make your faucets function easier, or require additional plumbing services, call (416) 769-8800 to request more information.